Annapurna Sanctuary Trek, Nepal: Doban to Machupachare Base Camp! Morning in Doban. No more rain clouds! Despite the twilight monsoon-ish downpour, sleeping at Doban was fine. There were only a few light pitter-pattery showers overnight, and the river’s music lulled me to sleep. No nightmares this time. Doban lay in a steep, waterfall-laden, forested, tightly wound valley. Morning broke clear. As always, snowy Machupachare watched over us. Today we’d hike along the Modi Khola River, up and down with an eventual attainment of 3,576 feet by evening, arriving at 12,204 ft Machapuchare Base Camp! From there, it’s another 1,231 feet to Annapurna South Base Camp – the Annapurna Sanctuary itself. This is the bit. Yes it is a TON of climbing and descending to finally arrive at Base Camp. But the thing is, the ascending and descending north and south facing slopes of this incredible canyon reveals incredibly diverse biospheres at each elevation or direction. South facing slopes have produced incredibly dense forests with bamboo or rhododendron, whilst the north facing slopes have flora resembling a high desert plateau. And as we continued climbing, we were increasingly in close proximity to mountains 23,000 – 27,000 ft, and the weather was changing accordingly. Up here, things change quickly. Expectations of a full day of sun were dashed, and in their place we experienced chillier, damper, and sometimes foggy weather. However, it could just as easily clear up for a couple of hours and become warm! A porter taking a break. Sedimentary layers create gorgeous waterfalls! So I donned what clothes I thought best, and stashed extras in my day pack, including the pack cover for an unexpected shower. After a multi course breakfast, we set off. And our dedicated kitchen staff, porters, and guides worked for us. The “stepped trail” pretty much followed the left side of the river, climbing up and down along the way. It was very beautiful, as the rainy downpours created incredible 500+ foot waterfalls coursing down the valley on both sides. It was on this day that the moment happened when I knew that I got the experience I was looking for on this trek. It just happened in an unexpected way. Sometime in the morning, our hikers split into a lead and a following group. And I found myself in the lead group. All during this trek, and for that matter, on any trek, there are some ‘concentrations,’ or ‘distractions,’ well, I don’t know know exactly how to describe them, or perhaps they can be described as the “snow globe of thoughts that must be addressed,” but they are there. I am not passing judgment on these things, but they are simply part of any trek. Such things are sentiments about keeping up with other trekkers, breathing the oxygen necessary to get legs over the next pass, performing the best “rest steps,” or talking with other trekkers, or waiting for other trekkers, well, I don’t know. And, as these things are natural, there is nothing wrong with these sentiments/duties or ordinary aspects of hiking with others and on challenging terrain. But the thing is, they distract from experiencing the natural environment in which one treks. Like static blocking out the beauty. I’d been talking with other trekkers, or de-layering to be comfortable, not even thinking I was missing something essential. So on this day one of us passed me playing some kind of pop music on their cell phone. I was so totally turned off. I just wanted to experience the Himalaya – leave that stuff back home. So I slowed my pace so that I allowed the front group to get ahead so that the noise died away. Before long, I only heard my boots on the trail , birds overhead, my own thoughts and lullaby of the Modi Khola river nearby. I found myself alone, in between the front group and the following group of trekkers. And everything about trekking fell into place. My footsteps, the river burbling, the birds soaring, Machupachare seemingly watching, I don’t know, it all just came together and I guess the serotonin in my brain started pumping. I was lifted up into some kind of nirvana-like state which I wanted to go on forever! This just went on and I felt absolutely nothing about walking up and down that trail until lunch. Nothing but pure pleasure worth every penny of going on this trek. I just couldn’t believe how it seemed to require withdrawing from other people. But it was there nonetheless. Maybe it just required withdrawing from the snow globe of requiring to respond to others and then to just focus 100% on THE PRESENT. I just don’t know. But it was there. It was 100% palpable and incredible. Such simplicity, Such whole-ness. Here is a sweet video of one of our rest stops on this day. During our delicious multi-course lunch, a sinister cold-moist breath reached our break spot. It was the Himalayan cloud pattern, which reversed the sunny warmth and in its place laid a moist, cold foggy layer. Yikes! It was so palpable I was taken aback. But it required an after lunch re-set of layers once again. The trek up to Machapuchare Base Camp was varied. At certain points it opened up above tree line, where we could see where we were going, but then again, the fog would close in, so we really didn’t know what was coming up. At one point the trail seemed to open up and become more level, but then again the fog rolled in, the steps steepened, and I had to stop and re-layer. 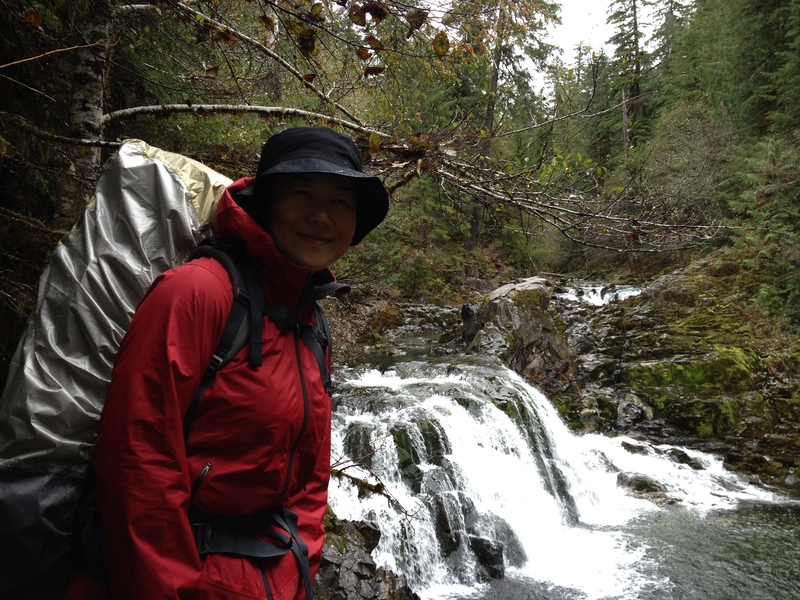 The lead group forged on, and MingMa stayed with me as I layered for the final push. This last part of this leg, for me, was super annoying. Reading the trip description I thought this section was more level, but OH NO. In fact it was steps ascending relentless to the camp. This was confirmed on the way back down, it was a whole heck of a lot of steep, high, steps. I give MingMa a ton of credit for going with me on this last stretch. 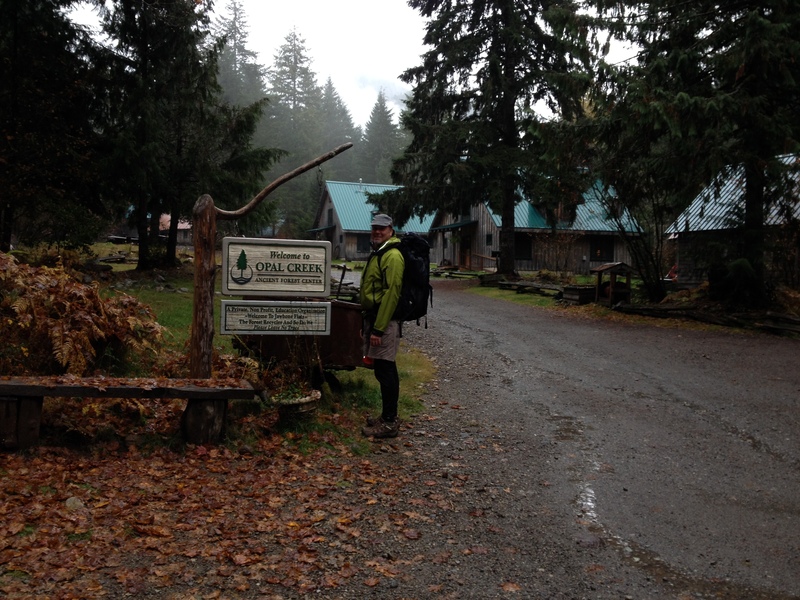 Once we arrived at ‘MBC,” it turned out to be a complex with multiple lodges, tea houses, and camp sites. It was so foggy MingMa had to figure out where our group was camped. It took Oh, 10 minutes to find our group. This time, I’d had it. I was finally out of dry clothes and with the cool fog, no way to dry anything. I pretty much gave in to the idea of just staying around camp the next day, maybe taking a 30-minute each way hike, try to dry things out. However, our plans changed. The original plan was to spend two nights at MBC. But that would mean two very very long days before we get down to the end of the trek. So, it was decided that we’d hike out of MBC for a couple of hours, and spend the night. That way, it’d shorten one of the days hiking out. No pictures of arrival at MBC, too foggy. But I can show you our dinner! In the kitchen tent. Our cooks were super. They made pumpkin pie, apple pie, two types of cake, and even some kind of fruit basket made of hard candy! They made a lot of local specialties like Momo, and a type of “potato chip,” lots of vegetable dishes, a type of tempura, but I cannot remember the names of the others! Speaking of food, they introduced me to SPAM! I don’t eat ham. But I tried spam at breakfast, and while I wouldn’t eat it daily, on a trek it was perfect. Next morning dawn was gorgeous and bright. The stars before dawn were unforgettable. I’ll cover Annapurna Base Camp next! Snorkeling The Great Blue Hole – Lighthouse Reef Belize! A lush ecosystem just under the surface! Made famous by Jacques Cousteau, The Great Blue Hole lies in Lighthouse Reef, 55 miles off the Belize mainland. He said it’s one of his top 10 dive sites in the world. Physically it’s 1,000 feet wide and 400 feet deep – whereas the rest of Lighthouse Reef is 22 miles long and 8 – 10 feet deep. The outer ring of the blue hole is an amazing forest of coral just below the surface. 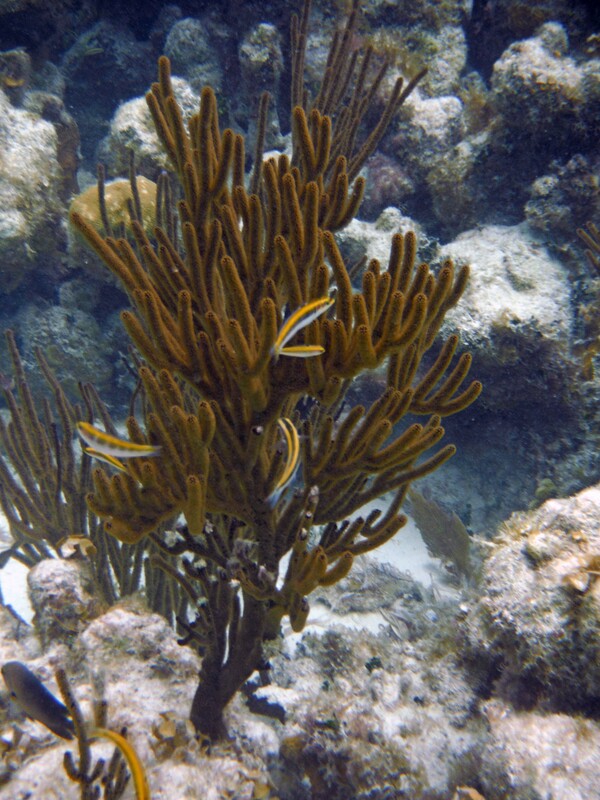 Click here for a wonderful time snorkeling amongst the corals! No diving gear is required to explore this lush paradise of fish and coral. Divers can descend to explore the many caverns below. 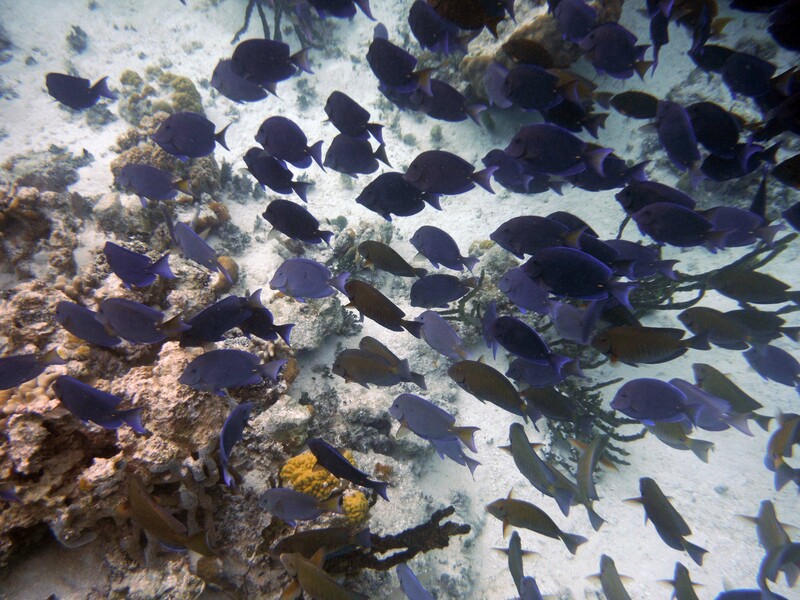 Click here for blue tang synchronized swimming! The Blue Hole wasn’t always a hole. Turning the pages of time way back to the Ice Age, Lighthouse Reef was an island several hundred feet above sea level. At that time, the Blue Hole was above sea level and it was a cave. It was a great cathedral with side caverns filled with growing stalactites and stalagmites. Then the earth warmed, the Ice Age ended, and as glaciers melted, the sea level rose. The island was submerged under water and became Lighthouse Reef. The roof of the cave collapsed, and sea water entered, creating what we see today. Our Island Expedition guides shuttled us out to the Blue Hole as it’s pretty far from Half Moon Caye. Once there, we slip on our flippers, don the dive masks, and somersault into another world. Once I adjust my mask and focus, a wave of excitement washes over me! This spectacularly preserved ecosystem is but a few feet below the surface, and I can swim right through it. 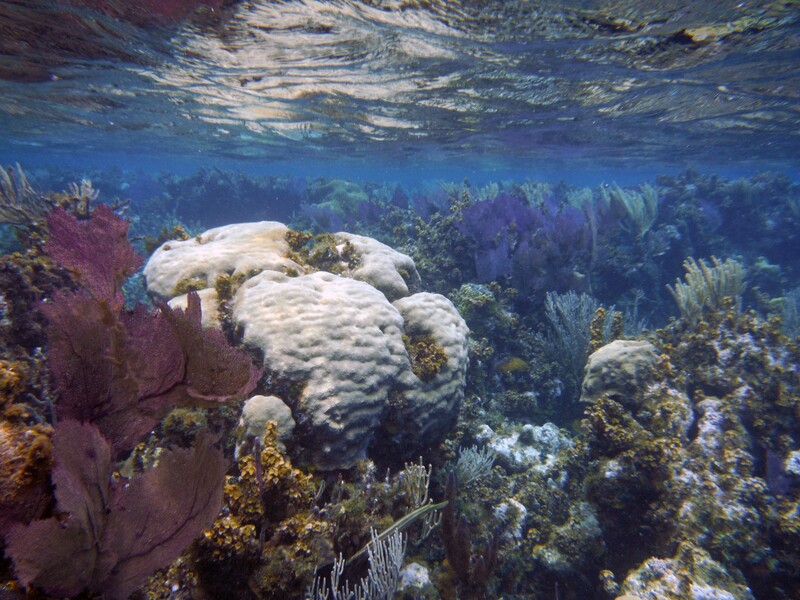 This is the healthy reef system I was longing for – everything I wanted to see. It is the ultimate snorkeling experience. Snorkeling the ring surrounding the Great Blue Hole, you witness healthy brain coral, staghorn coral, sea fans, barrel sponges, great barracuda, reef sharks, midnight parrotfish, grunts, blue tang, hawksbill turtles, angelfish, fairy basslets, eagle rays, and much much more! We spent three hours at The Great Blue Hole, but I could have explored a full day there. I knew that down below snorkeling level, there are great predators. Great Hammerhead Sharks, Bull Sharks, Lemon Sharks, and more spend time at depths in the Blue Hole. But the examples of these species are juveniles – they come to this spot for protection from predation by the full grown members of their own kind out on the ocean side of the reef. For this snorkeling trip, I purchased an underwater camera capable of video. It is the Fujifilm XP60. Like most point and shoot cameras these days, it only has a video screen. I am far sighted. So it was difficult to know, looking at the blurry screen in front of me, if I was definitely in focus, or even had the subject correctly framed! Add to that my body bouncing on the surface, or down under, holding my breath. Further, fish don’t just pose for pictures. They are always moving. I learned to listen to the beeping sound for focus. Another factor I learned about is that underwater, the further you are away from your subject, the more blue-tinged the photo shall be. The closer I took the photo, the more the real colors showed up. Andy, one of our group, knew how to free dive. He could go down 20 feet and just hang out down there and got the most incredible close up photos of fish. Another factor in getting good photos of fish is their behavior. Fish tend to retreat into their hideouts when you approach. But if you linger a bit, they come back out. Lingering underwater with lungs full of air is pretty hard because your body tries to float up. Andy’s trick is to hold onto something like a rock. He gave me some tips on staying down longer. Instead of using your air/energy do go down by kicking hard with your flippers, get completely vertical with your head down and legs straight above and let the weight push you down. When you are feeling pressure, pinch your nose and blow out to equalize the pressure. Now that you are down, and equalized, you have more time to stay down…and you can grab a rock to keep you from floating up too fast. I tried this and many times, I got so comfortable down there I lost track of how far I had to go up to catch a breath! It was fun, and a new thing for me. The Blue Hole was certainly well worth visiting! But it’s far offshore. So I recommend spending a few nights on one of the islands out on the reef. 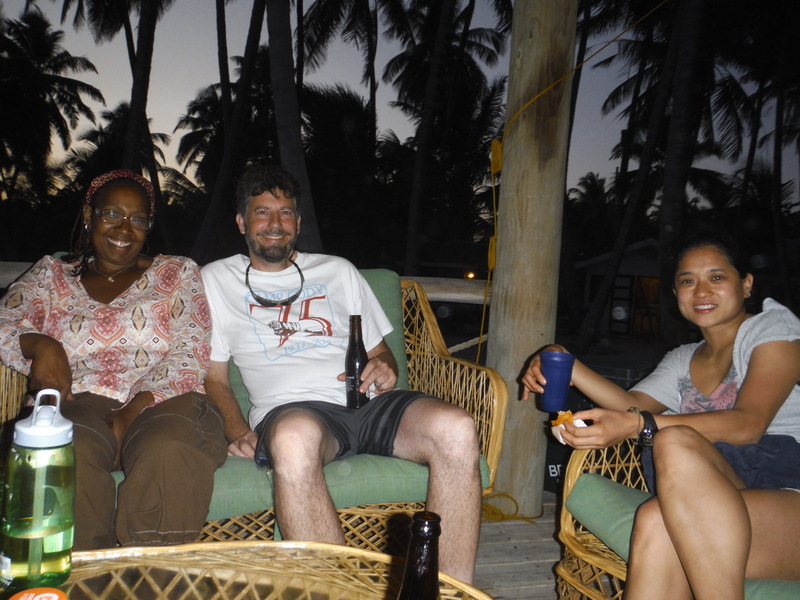 You can always book with Island Expeditions! They’ll take good care of you. Snorkeling around Half Moon Caye Belize! I chose this trip because I had learned Belize has some of the Atlantic’s only coral atolls – and that their reefs are super healthy. It was all true. Snorkeling just off Half Moon Caye Belize is super easy. Simply slip your mask, snorkel, and flippers on, and a mere 50 yards from shore amazing underwater wildlife thrives. 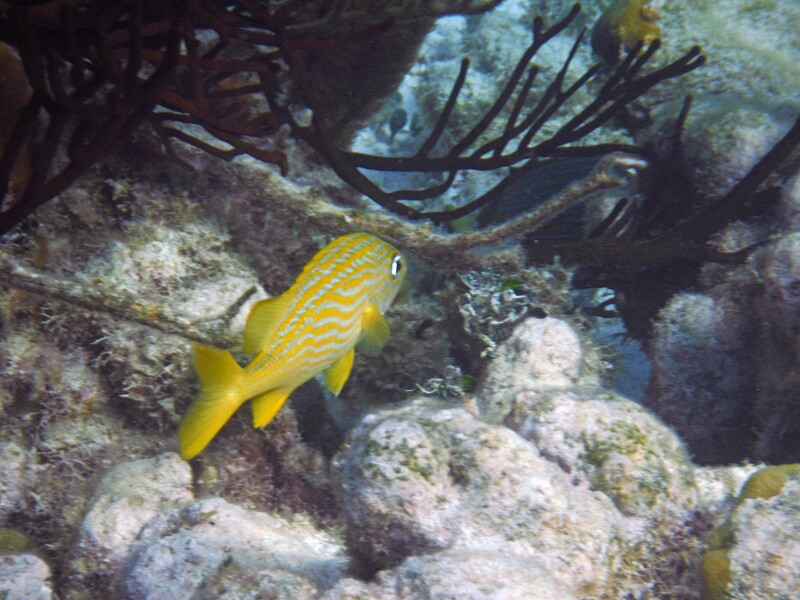 This blog post covers some simple snorkeling just off the island. On the west side of the island, Lighthouse Reef’s 8-10 foot lagoon sports countless coral heads, which are home to dozens of species of fish, turtles, lobster, and squid. On the east side of the island, it connects with the reef ringing 22-mile Lighthouse Reef. Our first snorkel took place out there. 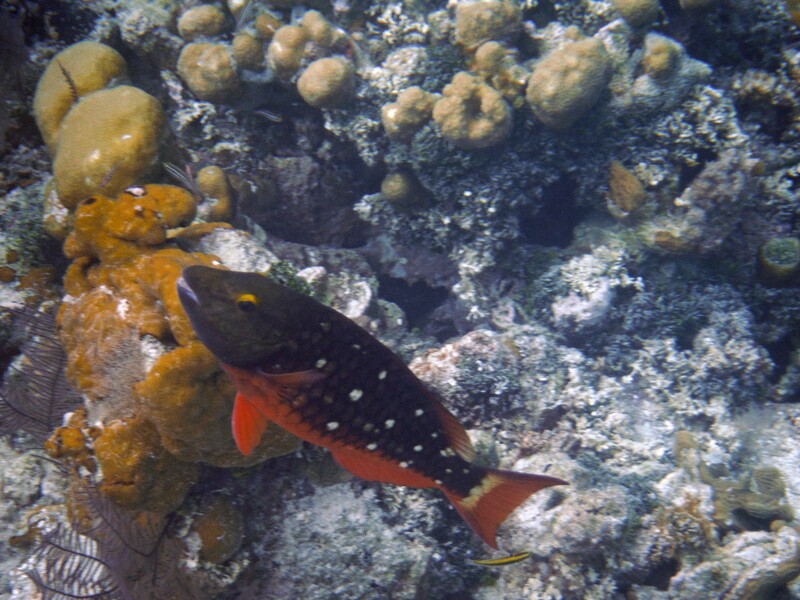 Right off, I was rewarded, witnessing so many brightly colored reef fish living out their lives in this protected reserve. Lots of grunts on the reef! 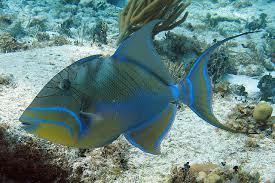 Some of the most common fish on the reef are grunts. 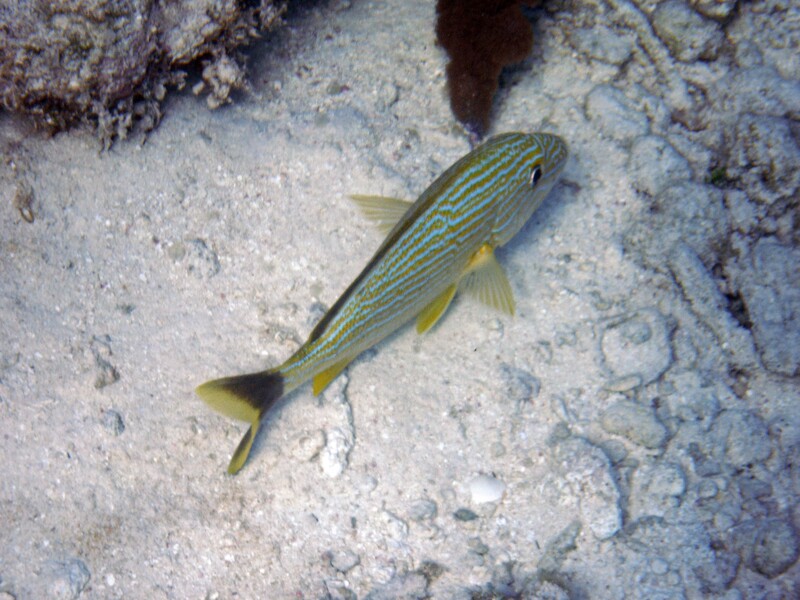 There are different variants, but a frequently seen grunt is the Blue-Striped Grunt. 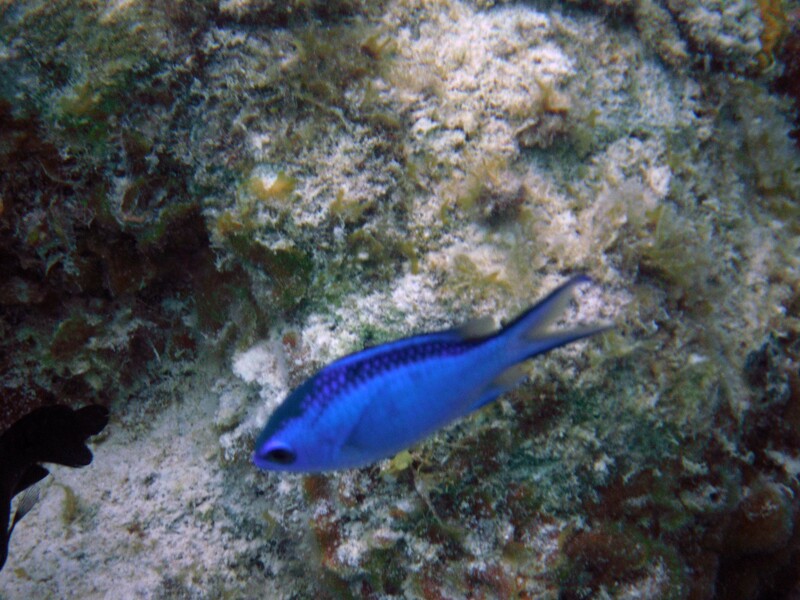 Another fish I saw lots of is the Blue Tang. Rarely seen are the Spotfin Butterflylfish. There were sharks, too. And rays. And Parrotfish, and Barracuda. And Squid. I swam right over this Nurse Shark – I almost didn’t notice it! I brought an underwater camera along for this trip. I was learning to use it as the trip progressed, and I was able to get some video of underwater wildlife. In this video, I was shooting for images of parrotfish and blue tang on a coral head – but I did not know I was about to have my first shark encounter! In this video, I simply swam 50 yard off the beach and saw parrotfish and trunk fish! Here, you can see a beautiful Stingray I encountered just off the beach! 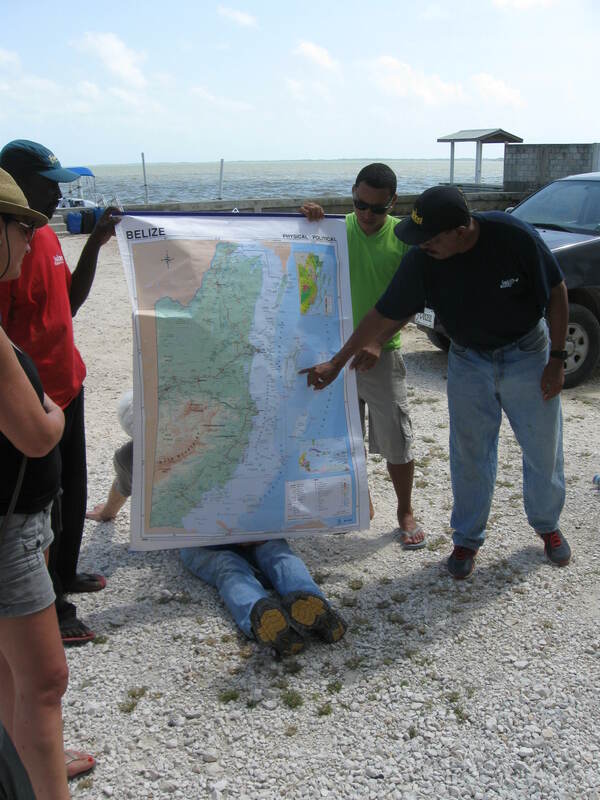 If you have seen “Gilligan’s Island,” then you might have imagined Island Expedition’s small operation on Half-Moon Caye. It is a true slice of paradise! No more than a mile long, coconut palm forested Half-Moon Caye sits in the southeast edge of Lighthouse Reef. Just off its eastern edge, the water drops to 12,000 feet deep. But inside the 22-mile long lagoon, the water is no more than 10 feet deep. 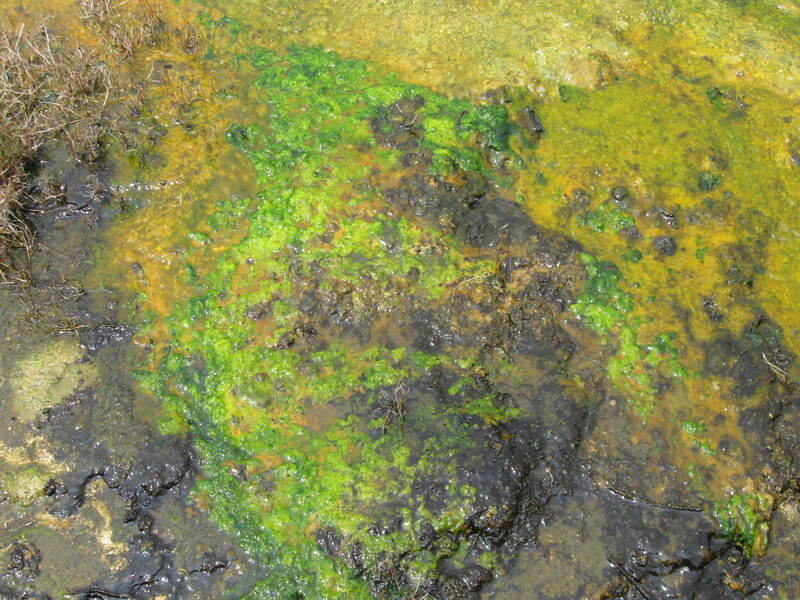 This creates some interesting explosions of sea life, which we’ll explore in later posts. 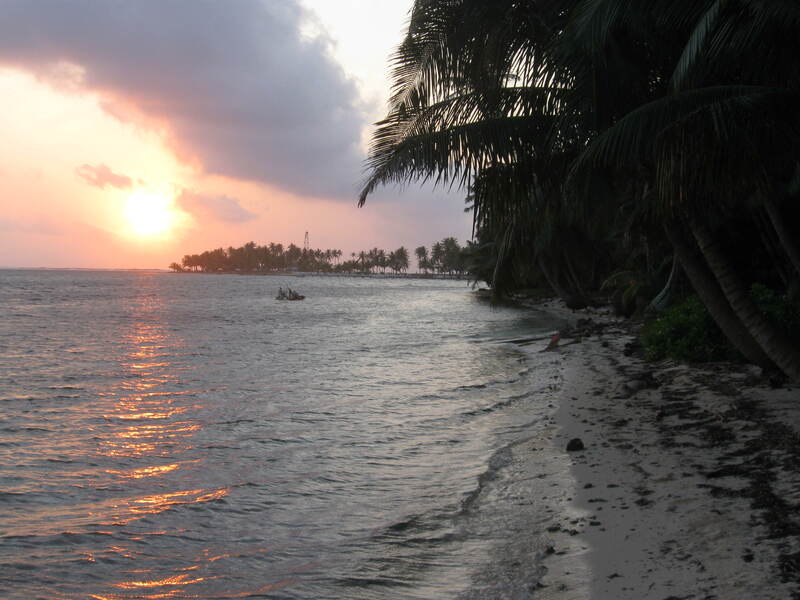 Half-Moon Caye and several square miles around it are a World Heritage Site. 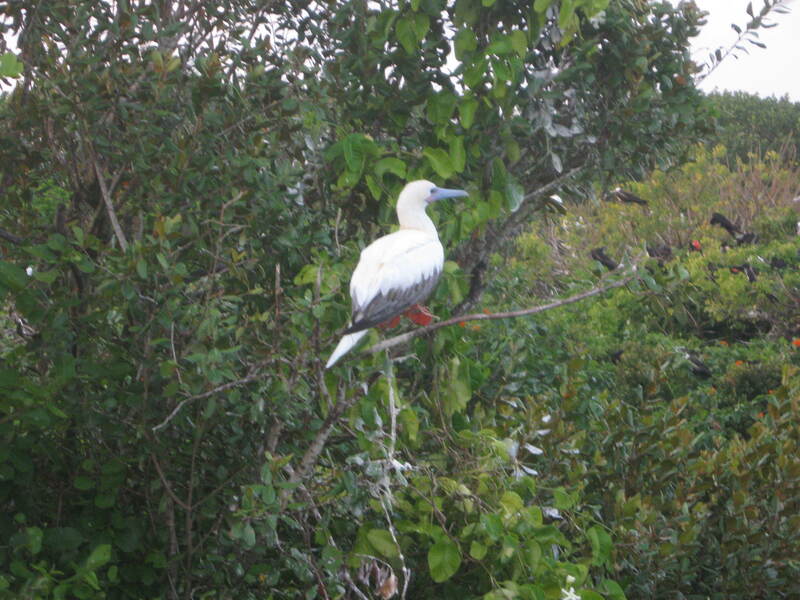 The caye hosts a colony of rare red-footed booby birds. These birds are amazing acrobatic aerial fishermen. Every day hundreds issue forth to forage in the ocean. They bring back food for their young, but they are never alone. Red Footed Boobies are symbiotically connected to Frigatebirds, which steal the food for themselves. Like an F-15 the Frigatebird wheels to steal some food. Frigatebirds are even better fliers than boobies. But they have absolutely no fishing skills. They are completely dependent on stealing food from the boobies. So much so, that frigatebirds defend the entire colony from other scavenger species such as sea gulls or petrels. Oddly, the boobies seem OK with surrendering food. Island Expeditions had about 12 platform tents arranged along the east side of the island, facing the ocean. Just beautiful, with coconut palms overhead. I certainly enjoyed my tent, which had two twin beds inside. It was simple yet thoughtfully laid out. It had strong pipes for a frame. It had a nightstand, a table, a laundry line, a hanging “dresser,” and an anti vermin cannister just in case. It stood up to the 24mph winds one night. One job all of us had was keeping sand out of the tents! Here is a video of the layout. Here is a video on a calmer day…with snorkelers! Lodging is a misleading term, because we “lodged” in platform tents – each with beds. No super resorts here: exactly what I wanted. There were 12 tents lined up along the shore. 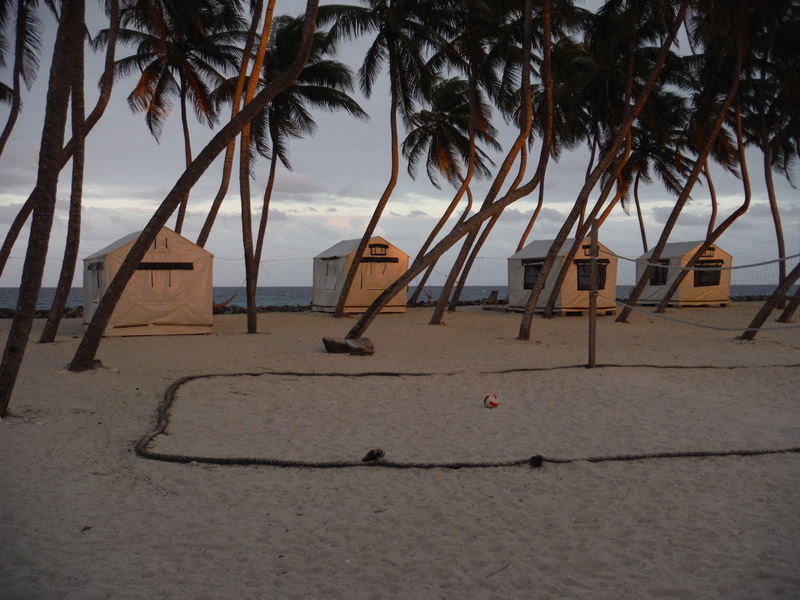 Island Expeditions runs a sustainable operation – with water from rain collectors, a well, and composting toilets. Electricity was on four hours per day, just enough to charge your camera batteries. So, we were far from luxury yet far from roughing it. The kitchen served up three sumptuous meals daily. 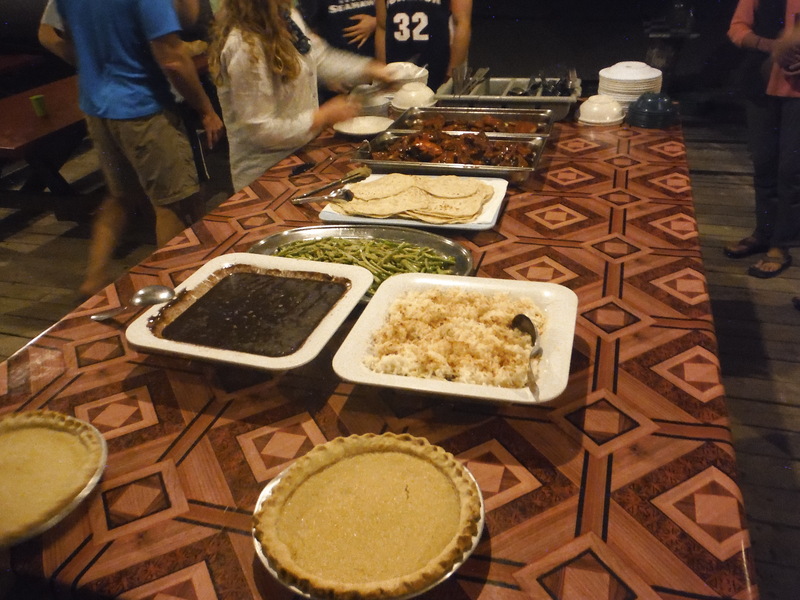 Dishes included Creole fair (lots of bbq), plus conch soup, coconut pie, pineapple and mango, and when we caught fish, catch of the day. Rise and shine! 6:30 a.m. yoga. 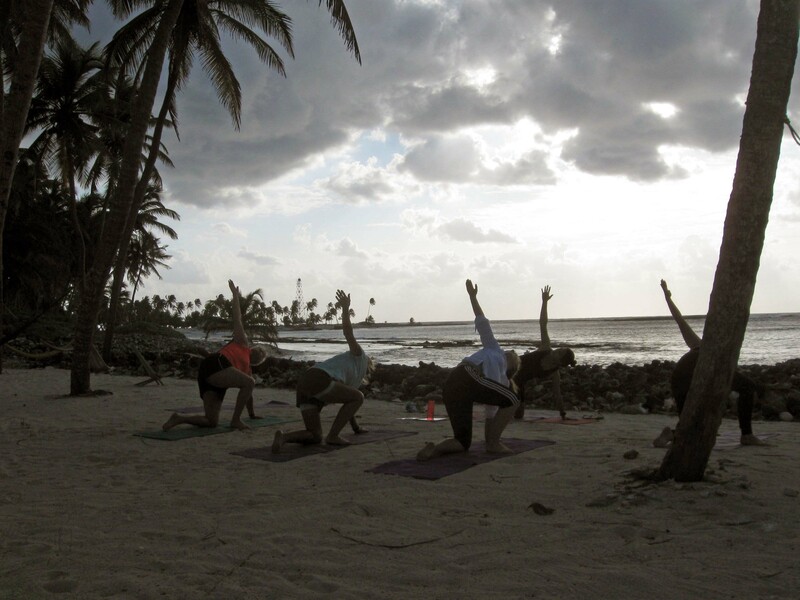 We were fortunate to have Tisha, a yoga instructor from British Columbia, on hand. Each morning she’d lead us in stretching and moves to open up the day. In the evenings, we all gathered in the dining tent for discussions of the days adventures and misadventures. With island life taken care of, we had much off shore activities to pursue. So the next series of posts will explore kayaking, fishing and snorkeling in Lighthouse Reef, and the Great Blue Hole! 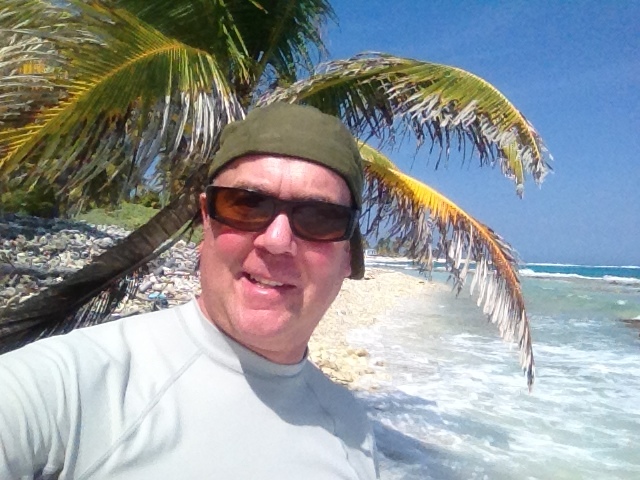 The next series of posts to Cabin Fever Chronicles shall focus on a sun-splashed week I spent on Half Moon Caye, a tiny coconut palm island on Lighthouse Reef, 50 miles off the coast of Belize. Why Belize? Why did I pick this trip? For starters, I usually think of mountains and cultural immersion when fantasizing about an overseas trip. This time, I wanted to switch it up. I’ve been to hot, humid, jungle destinations like Laos, Cambodia, or Northern Thailand. I actually was close to picking a trip to the headwaters of the Amazon. But for the past year I’ve found myself researching places with healthy beaches and coral reefs. I cannot stand big resorts or cruise ships. No, I wanted an adventure. 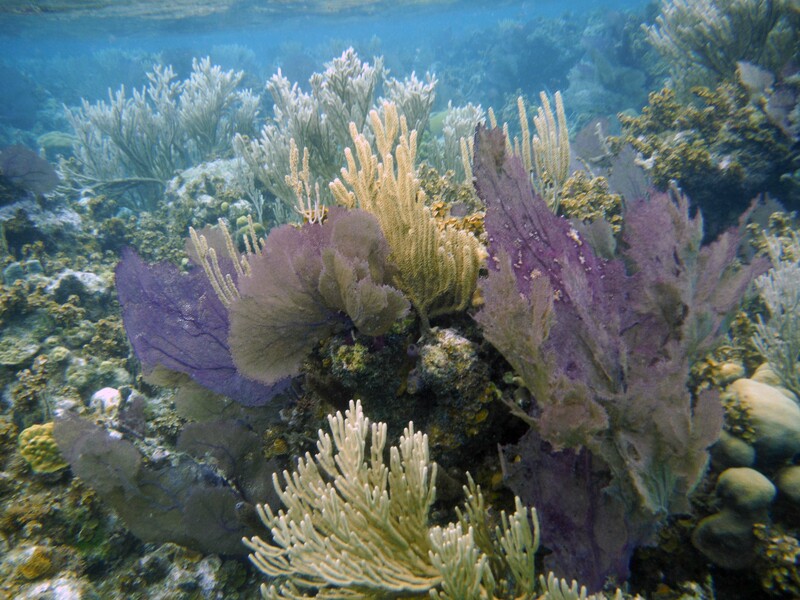 I have not snorkeled on a healthy coral reef since I was 14 years old. More recently, I snorkeled on some reefs off Bali, Indonesia, and Sayulita, Mexico, but these were in decay. Many of the healthy reefs are in the South Pacific, some elsewhere in Indonesia or The Phillipines. I also found myself on the Internet searching for Pacific Atolls. 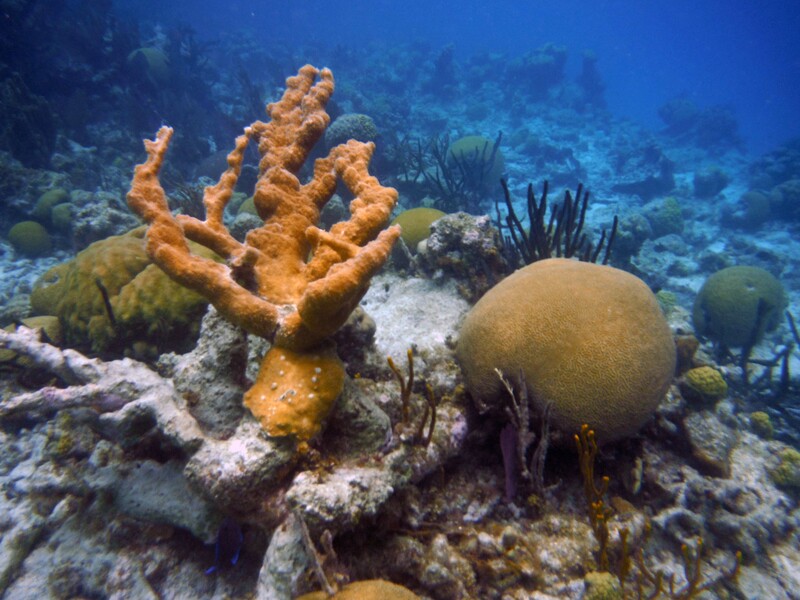 Along the way, I came across rare coral atolls in the Western Hemisphere – and most of them are in Belize. Another factor in deciding on this destination was my injury. If you read a few blog posts ago, you know I sustained a lumbar injury lifting a kayak – which referred down my hamstring. I’m still healing – so full-on camping is not comfortable right now. 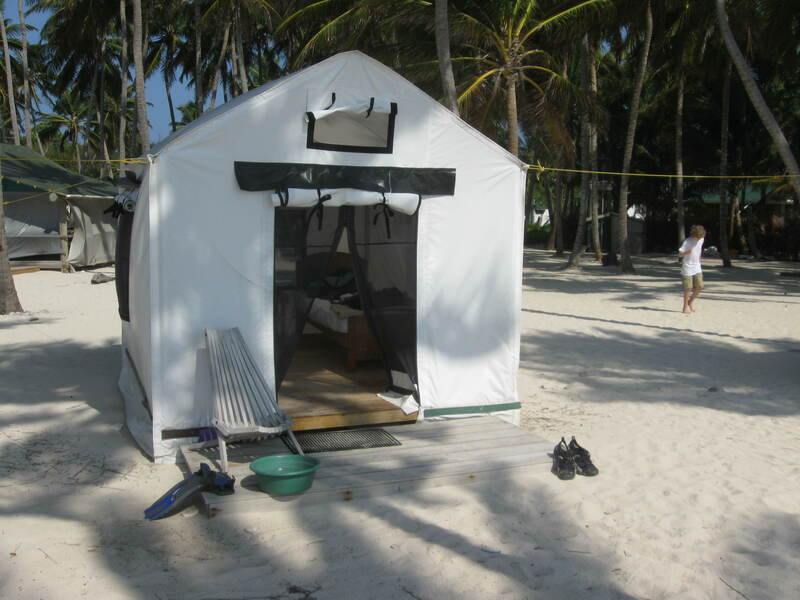 But I found a trip with Island Expeditions, and they have tents on Half Moon Caye that have beds in them. Perfect! This trip would involve kayaking, kayak sailing, fishing, and lots and lots of snorkeling. I can do all of that even with my recovering injury. This trip would be a perfect mental-health break from the injury-related-life I have been leading of late. Belize. It is a country on the east side of the Yucatan Peninsula. The coast faces east – the Caribbean Sea. Formerly British Honduras, Belize, which became independent in 1982, has a population of 324,060, and locals speak English, Spanish, and Creole. Inland, there are Mayan ruins, a few rivers which are fun for whitewater, and interesting caves to explore. Its highest mountain, Doyle’s Delight, is 3,688ft high. The country is only 180 miles long and 68 miles wide – not counting the atolls off the coast. The population is split amongst ethnic Maya, Maya/European (Mestizo), Creole, and Barifunda (African Descent). My flight to Belize was an overnight flight, from Portland, Oregon. Our first day was spent gathering up the seven souls participating in our Gilligan’s Island adventure. 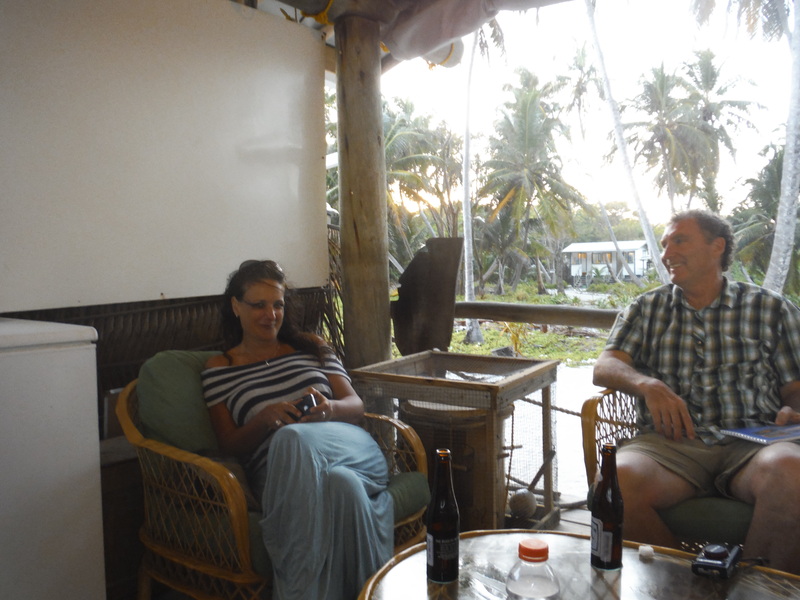 We would spend the afternoon and evening resting at the Bird’s Eye View Lodge, about 45 minutes from the Belize City Airport. The following day, after a quick cruise on the lake, we drove to Belize City and met our boat which would shuttle us out to Lighthouse Reef. 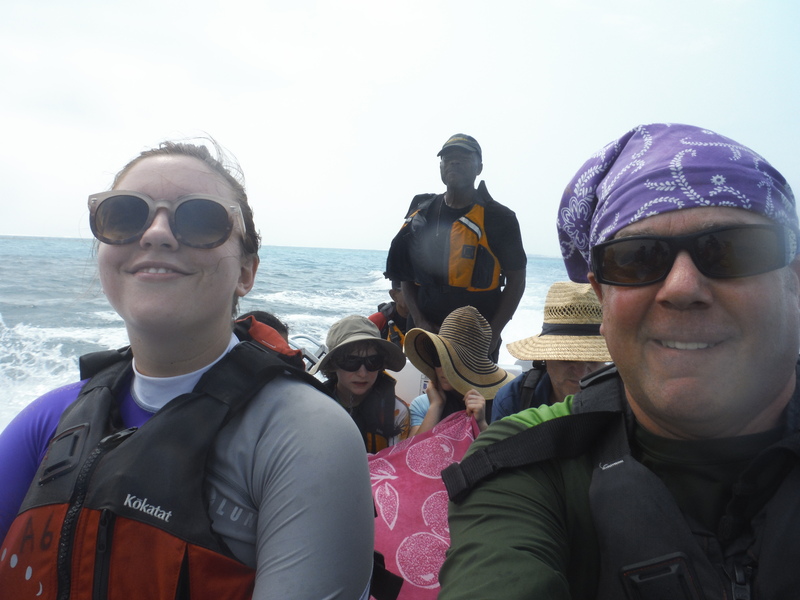 Our guides oriented us to the reefs off the Belize Coast, and our route out to Half Moon Caye. Here I am at the entrance to Jawbone Flats. A few hardy souls make this their year-round home. 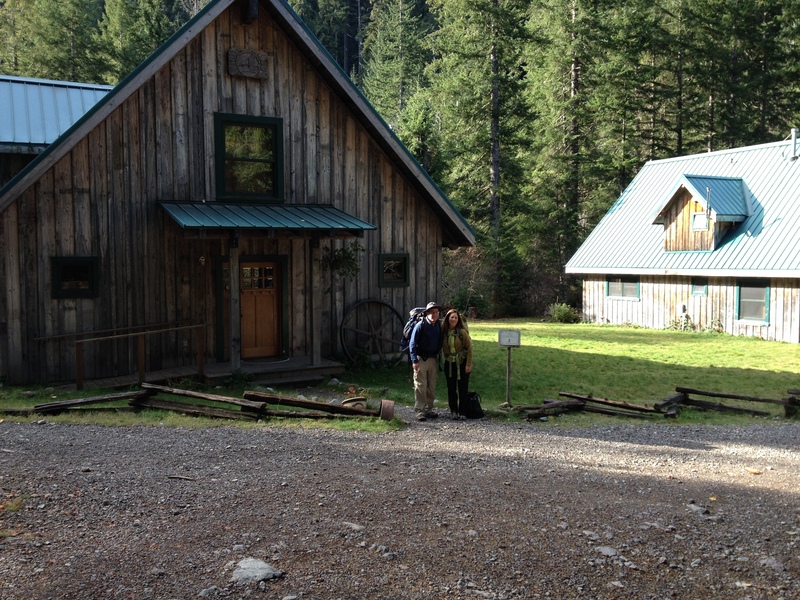 We recently spent a weekend at the cabins at Opal Creek Oregon! Opal Creek Ancient Forest Center and its Jawbone Flats Cabins sit inside the Opal Creek Wilderness, the largest old-growth wilderness in Oregon. It’s about a two hour drive from Portland. 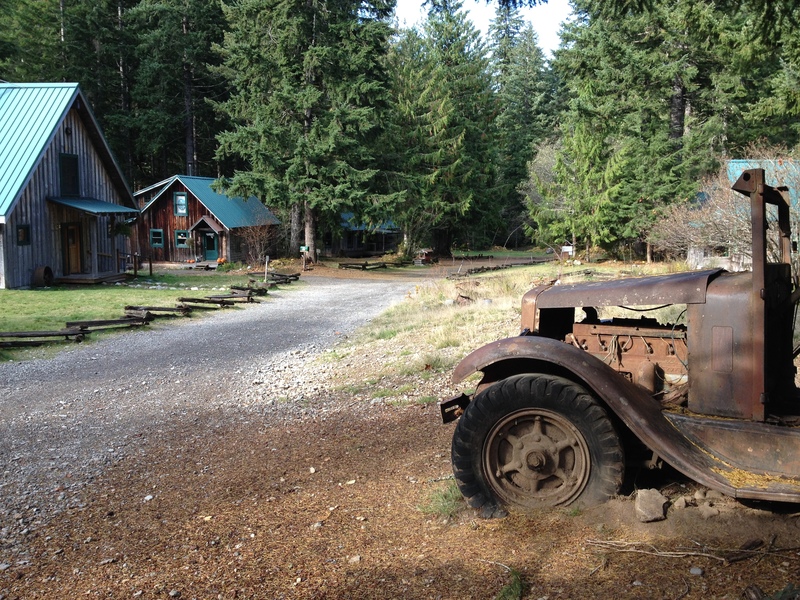 The village houses the Opal Creek Ancient Forest Center, plus cabins in which visitors may lodge. All around lies the incredible ancient wilderness with its myriad trails, crystal pure creeks, and countless examples of edible plants such as mushrooms. The village is a museum of early 20th Century mining equipment. The irony that is Opal Creek Wilderness is that an extractive industry saved the old growth forest, while rampaging logging was going all around it. It was privately owned mining operation and never logged. Later, a political movement launched a campaign to preserve the area and in 1996 Congress established the Opal Creek Wilderness. The village is “off the grid,” meaning all electricity is locally produced by a small hydroelectric generator harnessing the creek’s power. To get to Jawbone Flats, you must hike two miles from a parking area. You need to bring in everything you need to eat. Kinda. There is a twice daily shuttle that can bring up your stuff from the parking area. 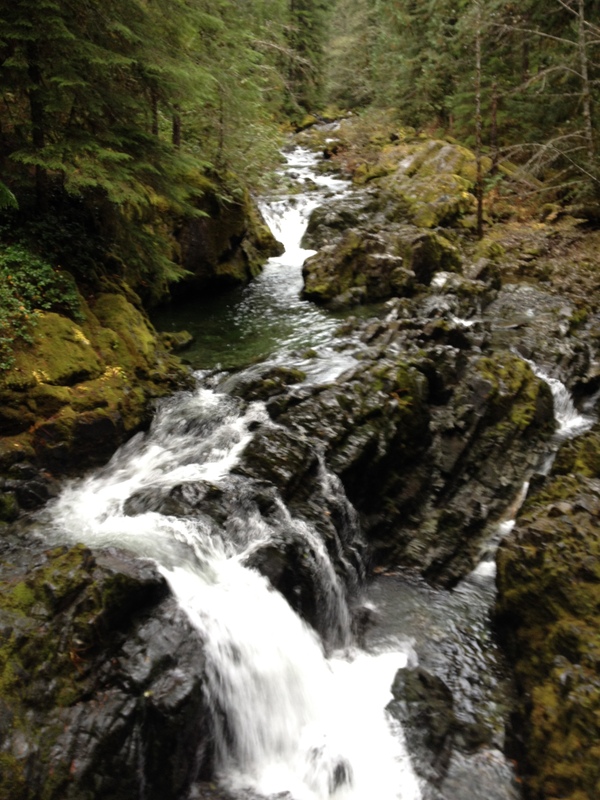 It’s a really pretty hike by Opal Creek. Along the way you pass by some dilapidated mining equipment. We reached Jawbone Flats and found our cabin. It’s really nice! You can probably house 10 people in the cabin. Very comfy, and the rear of the cabin has a deck overlooking the creek. Then we settled into our rooms. Next, we headed out onto some trails! Opal Creek Wilderness is truly a jewel! The old growth evergreens are unmatched, and the creek is so pristine. It’s such a beautiful area. I highly recommend it. If you go in the summer, the Opal Creek Ancient Forest Center has a menu of classes and trips to choose from, each guided by highly knowledgeable staff intimately familiar with the area. 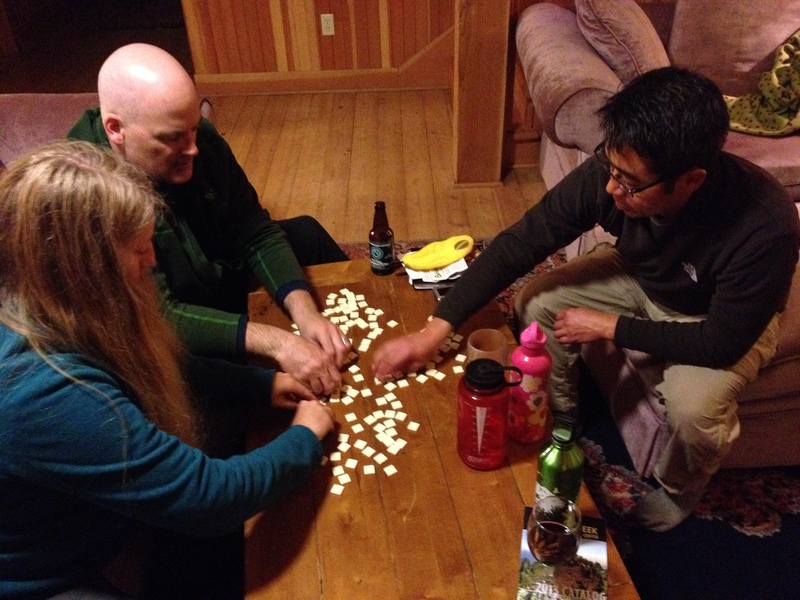 After our hike, we headed back to the cabin for happy hour, a wok cooking session, and playing board games! 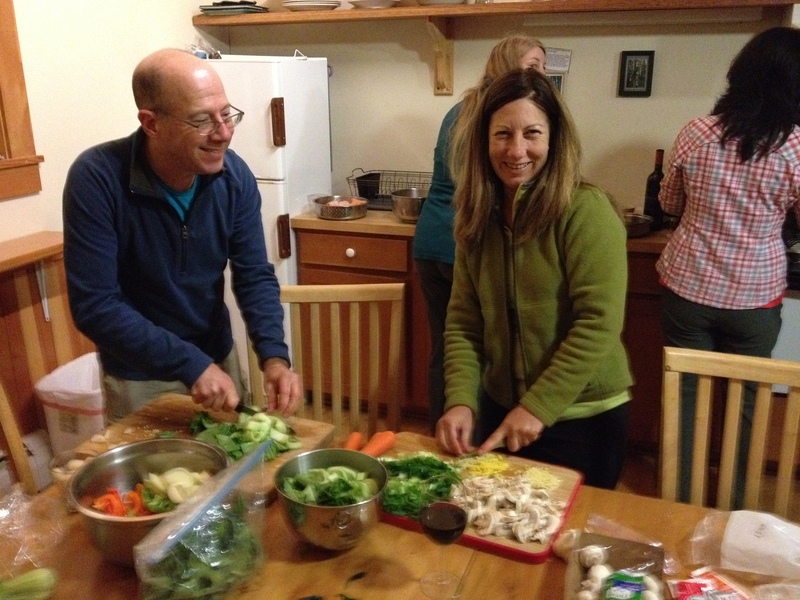 Lots of time spent chop chopping ingredients for the wok, and then delicious productions coming off the stove! After dinner, it’s board game time! If you want a quiet getaway not far from Portland, and want to witness a forest ecosystem unchanged since ancient times, Opal Creek is worth a visit. 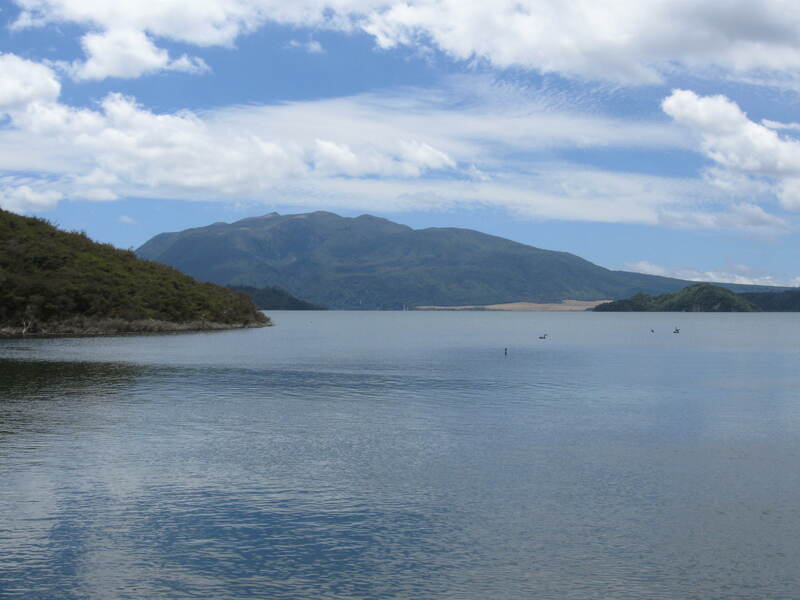 Mt Tarawera, at the end of Lake Rotomahana, split on both sides during its 1886 eruption. Rotorua New Zealand was our next base camp. 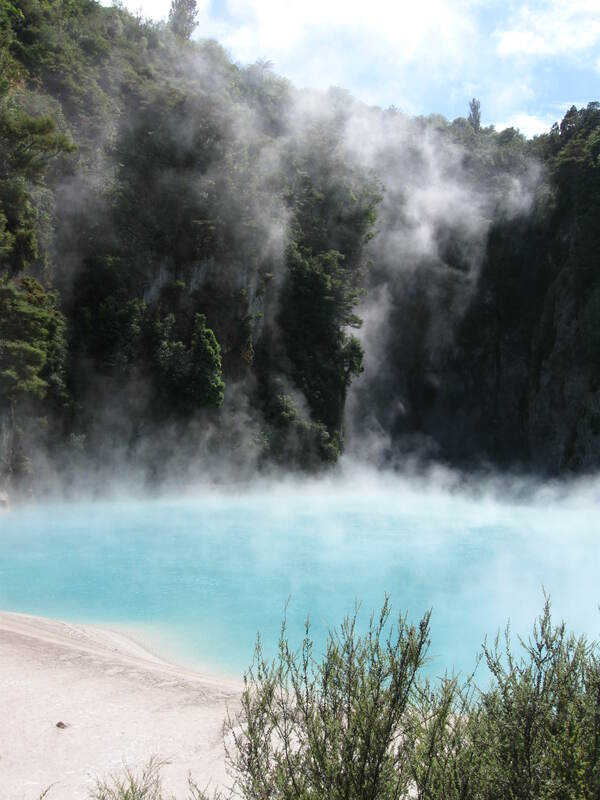 Rotorua sits on top of the country’s largest thermal system. Right inside the city of Rotorua, there are active geysers! And for hundreds of square kilometers around Rotorua, there are towns with mineral springs, mud pots, geysers, cracked mountains like Waimangu Volcanic Valley – it’s very evident that Planet Earth’s violent, and sometimes beautiful, geologic forces shaped, and are shaping the very area under your feet! We were really interested in experiencing some active geology first hand. We’d heard Waimangu Volcanic Valley was pretty interesting. We drove out there. Not knowing much about it, I was not prepared for what I was about to witness! We arrived at the park entrance, and picked up the guide pamphlet. It is a self-guided hike assisted at certain points by a shuttle. Reading the introduction, my jaw practically hit the ground. This is a 17-kilometer-long valley. It contains the world’s largest hot spring, and once contained the Waimangu Geyser, the world’s tallest, reaching 1,500 feet! That’s taller than the Empire State Building. In fact, the entire valley was created in ONE DAY! That’s right. If you can imagine. This was not fiction written from a novelist’s pen. It actually happened. This valley was someone’s ranch, just rolling scrubland hills. Then without warning, on the evening of June 10, 1886, Mount Tarawera, at the end of the valley, split open and erupted. Immediately following no less than 22 volcanic craters along the 17-kilometer valley were born. 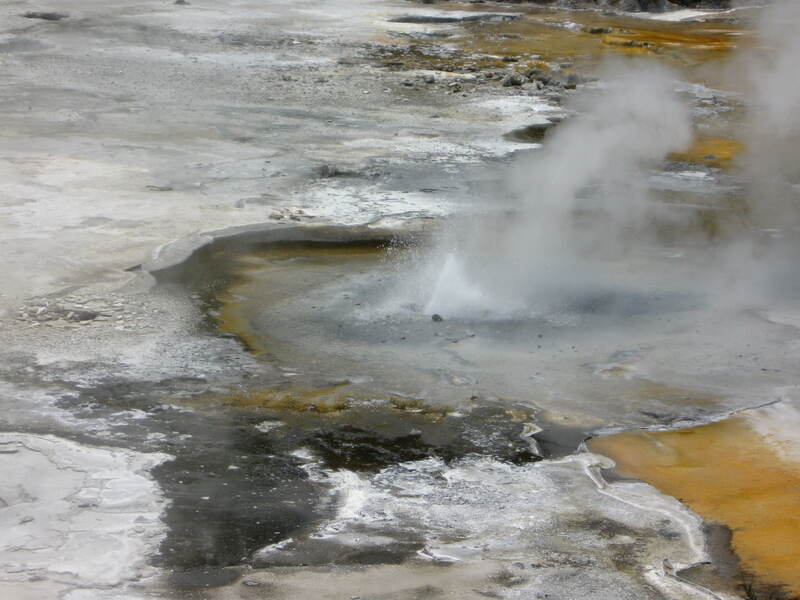 Plus a gigantic thermal geyser and hot spring area formed. It was the first time in recorded history mankind witnessed the birth of a geyser field! 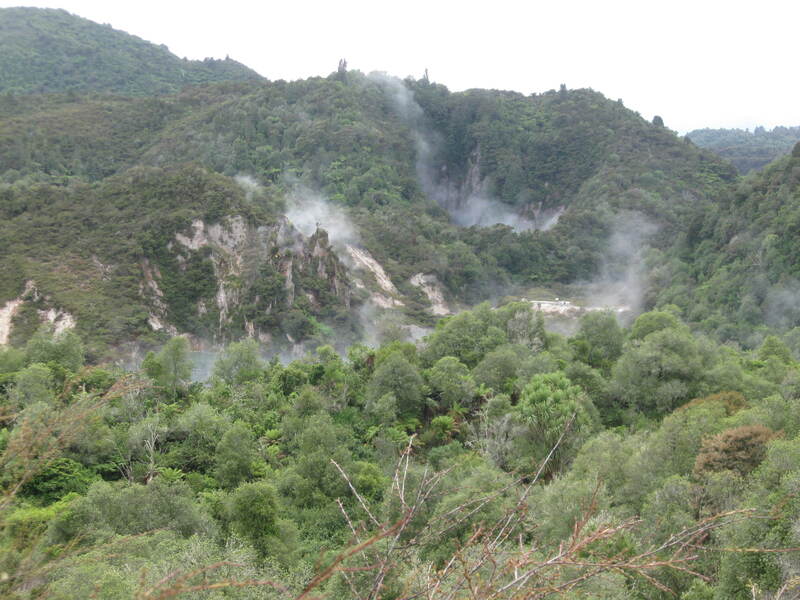 The Tarawera volcano and craters of the Waimangu Volcanic Valley’s 1886 event are the sites of the largest eruption in New Zealand’s recorded history. At the time, in 1886, the valley was devastated just like Mount St. Helens. What was once a lush forest with vibrant wildlife was laid to waste, nothing was spared. Atomic bomb shock waves flattened everything and ensuing pyroclastic flows atomized what was left. It was not long before the world learned of the fantastic event and tourists flocked to see the spectacle. 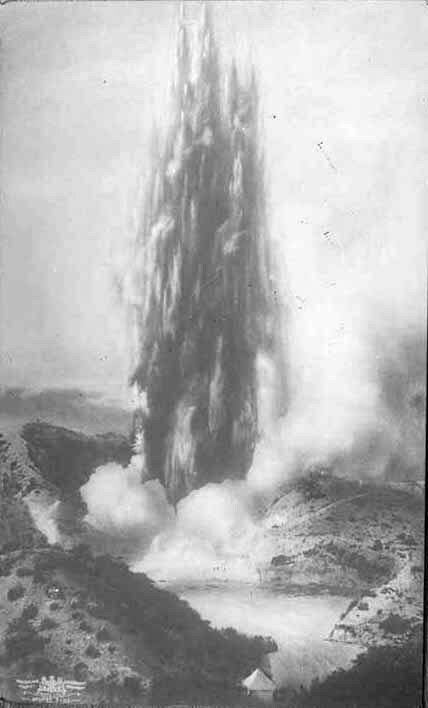 Until 1904, there was a building for viewing the geyser, and then another eruption destroyed it and soon after the geyser ceased. As with Mount St. Helens, life began to retake the moonscape, and within a few decades, the valley regained its lush look. Except for the fact that there remained a few geysers, a huge lake, steaming rivers, hot springs, and hills that seem to smoke! This geyser reached 1,500 feet! Today visitors can hike the valley all the way to the end, where they can take a boat to see more amazing geologic features on the lake formed by the eruption. From that end point, a shuttle moves you back to the start. All along the way, there are more than two dozen amazing sights to witness! The river flowing through the valley is filled with hot springs along its path. 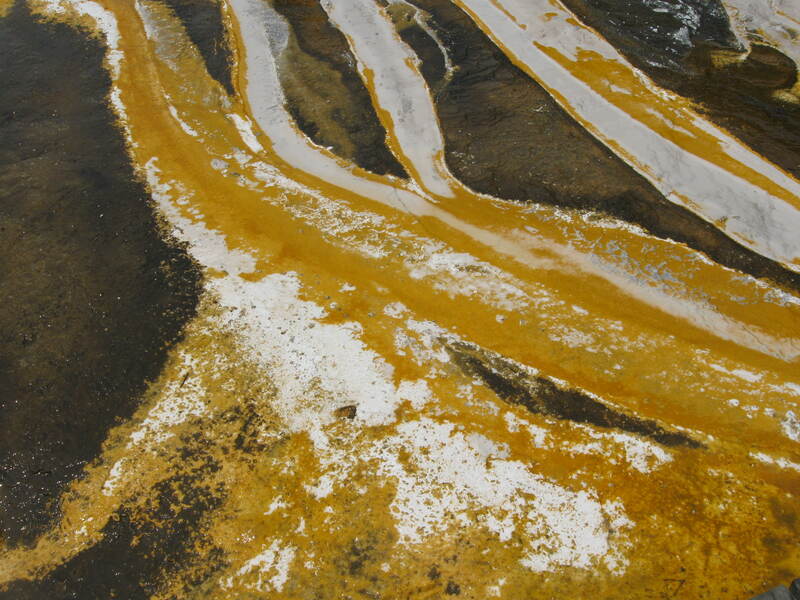 So, as you walk along and witness its flow, you’ll see how mineral deposits shape everything. There are beautiful bird songs from bell birds and tuis. In the lake, I can count 91 black swans milling about. It becomes hot. Sometimes, you can smell sulphur from the steaming vents. If you are seeking some hiking, exercise and really want an in depth up front experience of what earth can do, this valley will not disappoint!